We’ve christened Itamar and Sarit from Honey & Co, because they are just that. We’ve had them here at Ballymaloe Cookery School all weekend. On Saturday they taught two classes and charmed the audience with their easy manner and utterly delicious food. They cooked many of the favourite Middle Eastern dishes from Honey & Co, their tiny restaurant in Warren Street in Fitzrovia. It seats just 24 people and snugly at that but serves about 150 who come for breakfast, lunch and dinner from 8.00am-10.30pm. Sarit Packer has been cooking and baking since she was five, trained at Butlers Wharf and at the Orrery under Chris Galvin, where she learned, amongst other things, to make Pâte de fruits, which up to then was her sole ambition in life. In her spare time she sleeps. Itamar Srulovich born and raised in Jerusalem. Cooking since the age of five and leaving a great mess in the kitchen ever since, he trained on the job in various places in Tel-Aviv. He prefers eating to cooking and sleeping to both, he is very happily married to Sarit. They serve a lot of iced tea and homemade lemonades at Honey & Co. This orange blossom one is a particular favourite. Sarit tells us that “what we’re about is homemade flavours” and it just struck me that so many of the restaurants that people love nowadays in particular in London and New York are about homemade flavours. There’s of course are Middle Eastern and there are some dishes that they simply can’t take off the menu, falafel and their cherry pistachio cake. Spices, dried mint, tahini and sumac, zaltar and pomegranate molasses are very important in Middle Eastern food but we can get all these ingredients fairly easily now both in ethnic shops, supermarkets and of course mail order. Ottolenghi has a brilliant mail order service http://www.ottolenghi.co.uk/. Mableb was a new ingredient for me, it’s made from ground up cherry stones and gives a bitter almon flavour to cakes and cookies. It too is available by mail order. It’s a bountiful time in the farm and in the gardens. Itamar and Sarit were so excited by the quality of the beautiful fresh produce. We had lots of fresh peas, courgettes and their flowers, broad beans and the first tiny cucumbers. A joy to eat and cook with. Observer Food magazine awarded Honey & Co Newcomer of the Year in 2013. They have just celebrated their third anniversary so Pam baked them a gorgeous 3 tier cake embellished with roses, raspberries and spun sugar. Somehow in the midst of all they wrote the Honey & Co cookbook which was published by Salt Yard Book Co in 2014 to huge acclaim. Both Sunday Times and Fortnum and Mason awarded Honey & Co Cookbook of the Year 2015 and just last night they won the UK Food Writers Guild, First Cookbook Award. This is another restaurant to put on your London list and don’t forget to tell them that you made the discovery in the Irish Examiner. Here are some of the dishes that enchanted us all from their course but there’s plenty more gems in their cookbook. Don’t’ miss Tara Shine’s Head of Research and Development at the Mary Robinson Foundation – Climate Justice, inspirational talk on Sustainability and Climate Change at the Ballymaloe Cookery School on Tuesday June 23rd at 7pm. Phone 021 4646785 for details. Long to Grow your own Organic Vegetables – yes you can…..
Susan Turner, Head Gardener at the Ballymaloe Cookery School will provide you with the necessary skills to develop sustainable organic growing techniques. In one busy day, she’ll cover successional sowings, attracting beneficial insects and pest control, crop management, feeding regimes & harvesting organic year round crop production……..
You’ll also enjoy a delicious lunch with seasonal organic produce from the farm and gardens and the opportunity to exchange ideas. Susan’s many fans will confirm that her courses are dynamic and inspirational and tailored to every level, from novices through to avid gardeners. Students who wish to continue learning from Susan can progress to our Organic Horticulture: Autumn Harvesting & Winter Crops course later in the year. Bring the water to a boil in a pan, add the tea bags and stir around. Turn off the heat and leave to steep for 15 minutes. Remove the tea bags, add the sugar syrup and blossom water and stir to mix. Decant into a bottle or jug and push in the mint sprig and orange slices. Place in the fridge to cool entirely. Serve with loads of ice. Pimp your tea – crush some fresh mint leaves at the bottom of a lowball glass, add a shot or two of rum, top up with ice and iced tea and lots of ice. Mix everything together in a small pan and bring to the boil over a high heat, then reduce the heat and simmer for 2 minutes. Leave to cool, then transfer to a clean bottle or other container and store in your fridge for up to a week. Itamar is a quarter Yemeni on his grandfather’s side. This falafel is a tribute to that heritage, and it is great – the traditional Yemeni combo of coriander, cardamom and garlic makes it super-vibrant in colour and flavour. If using a meat grinder. Use the coarse grinder blade if you have one we find it gives the best texture. Cut the onion and garlic into dice so that you can easily feed them through the grinder. Mince the chickpeas, onions, garlic, chilli and herbs into a bowl. Add all the spices, salt, flour and baking powder and mix well to a very thick mass. If using a food processor. Start with the onion, garlic, chilli and herbs and pulse them to chop roughly, then add the chickpeas and blitz until everything becomes a thick paste with small, even-sized bits. You may need to scrape the sides down and blitz for another pulse or two to make sure that everything is evenly chopped, but do not overwork. The best way to check whether it is done enough is to scoop up a small amount and squeeze it together in your palm – it should hold its shape. If it falls apart, return it to the processor for another spin. Tip the mixture into a large bowl, add the spices, salt, flour and baking powder and mix until all is combined well. Preheat the deep fry 170C/325F. Test the oil temperature by placing a small piece of bread or falafel mix in the hot oil – as soon as it starts to bubble up and float, you are ready to go. Use damp hands and make little balls or torpedo shapes or you can simply drop in spoonfuls of the mixture for free-form falafel. You want to be making them about the size of a walnut, no bigger, so that they cook through and crisp up at the same time. Carefully place the falafel in the oil – don’t overcrowd the pan and fry until the exterior is browned and crisped (about 2-3 minutes). Remove to a plate covered with a paper towel to absorb the excess oil and repeat the process until you have fried them all. Serve immediately with tahini (see recipe). The quality of your tahini depends hugely on the type of tahini paste you use. We use Al-Yaman from Lebanon which is delicious, but if you are lucky enough to find any of the Palestinian varieties, especially the Prince and Dove brands, you are in for a treat. As a rule, you are looking for something from Lebanon, Palestine or Turkey. We make our tahini in a food processor, as it gives a smooth, airy, mousse-like texture, but you can achieve good results with a bowl, a spoon and some wrist action. Place the tahini, minced garlic, salt and lemon juice in a bowl or food processor, add half the water and mix. It will go thick and pasty but don’t fear – just continue adding water while mixing until it loosens up to a creamy texture. Don’t be tempted to add too much water as the mixture will go runny, but if this happens, you can always bring it back with a little extra tahini paste. Taste and adjust salt and lemon to suit your taste buds. Make this instead of a Shepard’s` pie next time you buy lamb mince for dinner. Place the cauliflower in a saucepan with the water and salt. Bring to the boil and cook for 5-6 minutes until the florets is soft. Drain and place in a shallow saucepan or casserole about 22cm (8 3/4 inch) in diameter. Fry the onions on a medium heat in a frying pan with the oil and 1/2 teaspoon salt until the onions start to go golden. Add the minced lamb and the remaining 1/2 teaspoon of salt, increase the heat to high and use a spoon to break up the meat into little pieces. When the lamb starts to brown, sprinkle on the ground fennel and baharat spice and cook for 3-4 minutes. Stir in the tomato purée and continue to cook for a further 3 minutes, then spread all over the cauliflower in the casserole dish. You can prepare this stage up to a day in advance – just cool, cover and store in the refrigerator until needed. Mix all the topping ingredients together apart from the water and pine nuts. If the mixture is very thick, stir in enough of the water to loosen slightly – the consistency should resemble thick yoghurt. Spread the topping over the lamb in the dish. Sprinkle the pine nuts all over and bake in the centre of the oven at for 15 minutes or until the tahini looks set and slightly golden. Sprinkle the parsley and serve. This, like its namesake in our kitchen, is the backbone of everything we make and, like its namesake, has endless depth and beauty, and improves almost anything. You can use ready-made baharat spice mix instead or Lebanese Seven Spice which is sold in most large supermarkets – it will taste slightly different but will still be tasty. Crack the dried chilli open and shake out the seeds. Place the deseeded chilli on a baking tray with the coriander and cumin seeds and roast for 6 minutes. Remove from the oven and allow to cool entirely on the tray. Crumble the chilli between your fingers, then grind all the roasted spices to a powder. Mix with the dried ground spices and store in an airtight container. It will keep for 6 months, but ideally use within 2 months for the full effect. This was the first cake I made for the restaurant. We wanted something that would sit on the bar counter and just make people stare. It has been with us from the first day and I have a feeling it will stay there until the end. We do vary the fruit on top, so we use red plums or yellow plums or raspberries, but really the cherries are the best version. 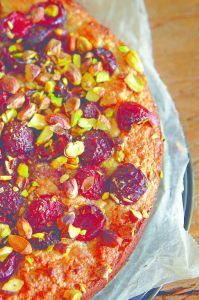 The contact between the cherries and the green pistachios, and the addition of mahleb to the cake batter, together create something electric. It is such an easy recipe to follow, I am sure it will become a huge favourite in any household. Preheat the oven to 190C/375F/Gas Mark 5 (170C fan). Lightly grease the cake tin with butter. Mix all the dry ingredients together in a large bowl. Pour over the melted butter and mix in the eggs, spoon the batter into the pre-greased tin and smooth down. Remove the stones from the cherries – you can do this with a cherry stoner or by just pulling them apart and popping the stones out with your fingers. I like to do this over the cake tin, so that any juice drips onto the cake and adds colour. Drop the pitted cherries onto the batter and sprinkle the top of the cake with the remaining 20g (3/4oz) of sugar and the roughly chopped pistachios. Bake in the centre of the oven for 25-30 minutes, then turn the cake around and bake for a further 8-10 minutes until the cake between the cherries goes all golden. Allow the cake to cool in the tin, as it needs time to settle, then gently remove by running a knife around the edges. Covered well, it will keep in the fridge for up to a week (not much chance of that happening), but for the best flavour, allow it to return to room temperature before eating.